Your group will be picked up at Keflavik International Airport. 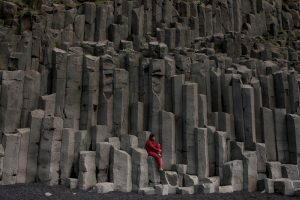 It is only a 20 minutes’ drive passing the town of Keflavik and a large lava field before we reach the Blue Lagoon. What an unusual and unique start of a holiday in any country! The Blue Lagoon is one of Iceland’s most popular attractions, a natural geothermal pool in the middle of a large and dramatic lava field and an oasis that owes its existence to a nearby geothermal power plant. We stop for 1½ – 2 hours for a refreshing bathe or a swim in the inviting, rejuvenating and pleasantly warm mineral-rich water (36°C-38°C/100-110°F), famed for its reputed healing properties. An indoor pool and geothermal sauna are also on the site. Bathing in this surreal environment is a unique experience no one should miss. The Blue Lagoon’s warm water and natural active ingredients like mineral salts, silica and blue green algae help you relax and escape the stress and strain of daily life. From the Blue Lagoon it takes about 45 minutes passing lava landscape and several suburbs before reaching Reykjavík, the northern most Capital city in the world. By a scenic route we reach Þingvellir (Thingvellir) National Park (1930) and UNESCO World Heritage Site (2004). 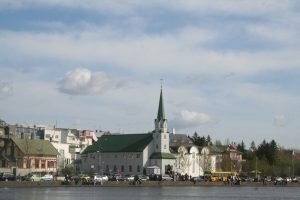 We stroll around the country’s most sacred site, home of the oldest existing national parliament in the world, the Alþingi, and major events in the history of Iceland. Thingvellir is a place of fascinating natural beauty, a spectacular geological vista, set on a vast plain flanked by large fissures, right by Iceland’s largest lake, Thingvallavatn. The Mid-Atlantic rift is clearly visible; a rift that is forming as Iceland is being pulled apart by tectonic forces. Here the North-American and the Eurasian continental plates drift apart by 19mm (¾”) a year and a rift valley is forming. Next we drive to the mighty waterfall of Gullfoss – the Golden falls – perhaps the most beautiful in the country. Here the glacial river of Hvítá (white river) tumbles 32 meters (105 ft.) in a double cascade. 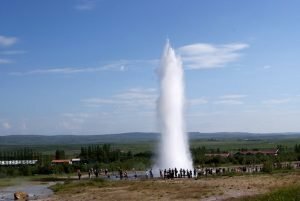 After an optional lunch stop we explore the active geothermal area of Haukadalur which contains the geysers Geysir and Strokkur, and many other hot springs. Most active nowadays is Strokkur, erupting hot water and steam to elevation of 25 metres (82 ft) every 5-7 minutes. Then we drive on to Skálholt, an ancient bishopric, and for centuries the spiritual and educational heart of Iceland. We pass the greenhouse town of Hveragerði and continue over the mountain pass Hellisheiði, an area with large lava fields and steaming valleys. City centre is a maze of narrow alleys framed with old timber houses from late 19th to early 20th centuries punctuated with more recent buildings. Reykjavík is the oldest settlement in Iceland (late 9th century) but became a town relatively recently, in 1786. We will learn about life in the city from the very beginning of settlement in Iceland to the present day. We stop by the church of Hallgrímskirkja and drive through the university district, past the Nordic house (Nordic cultural centre, designed by Alvar Aalto) and the National Museum. In the very city centre we stop by the City hall, which juts into the small lake of Tjörnin. Nearby are the Lutheran Cathedral (1847) and the House of Parliament (1881) and monuments to Jón Sigurðsson (19th century Independence hero) and also a sculpture of Skúli Magnússon, the father of the town itself. On the lake are many birds: many kinds of ducks, whooper swans and various seagulls and arctic terns (depending on season). We also drive by the harbour to observe fishing vessels of different sizes, whale hunters and whale watchers. In Reykjavík are many public works of art, mainly sculptures. Many of those are the work of Ásmundur Sveinsson (1893-1982) whose home and workshop we will pass near the recreational area of Laugardalur. The latest addition to Reykjavík is the concert/conference hall of Harpan (the Harp) built on the northern waterfront of the town centre whose dramatic design captures and reflects the light of the city, ocean and sky with a thrilling effect.